Ride improvement package or options for Salem Kroger 4x4? Can you post a picture looking square from the front of the van? Typically the draglink and track bar should follow the same arc. Which generally means they run parallel to each other (assuming similar length). A pic from the front will help show there relationship and will tell us if you do need to change your pitman arm. 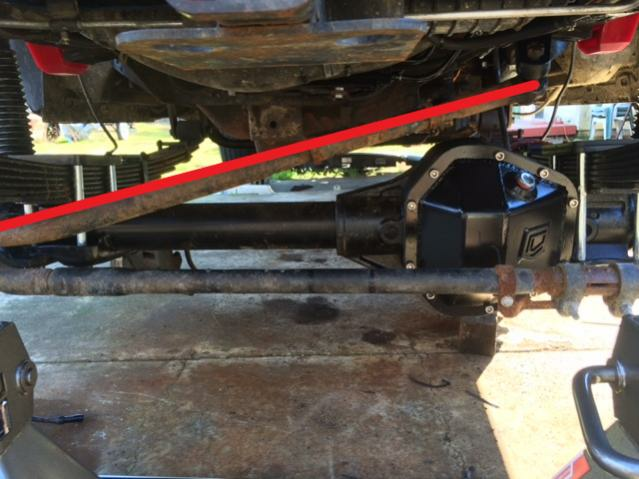 If they are off and the pitman arm can not be changed due to availability or lack of space, it may be possible to change the track bar frame or axle mount to correct the issue if that is a problem. Action Van in San Clemente CA sells dropped pittman arms for later model lift kits. I think Ramsey mentioned a few years ago that the keyed spline in the Ford pittmans come in two different indexed orientations...another variable to consider.....although I think one is much more common than the other. A 'dropped pitman arm' doesn't help to get the steering arm level, and reducing bump steer, on a van like it does on a truck. 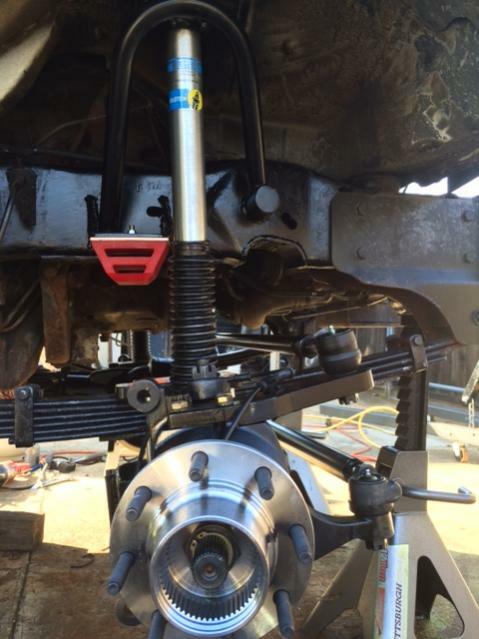 A trucks steering box is more straight up and down, compared to a van's steering box. Adding a dropped pitman arm to a van moves the steering drag link more forward, than down, which is not what you want. 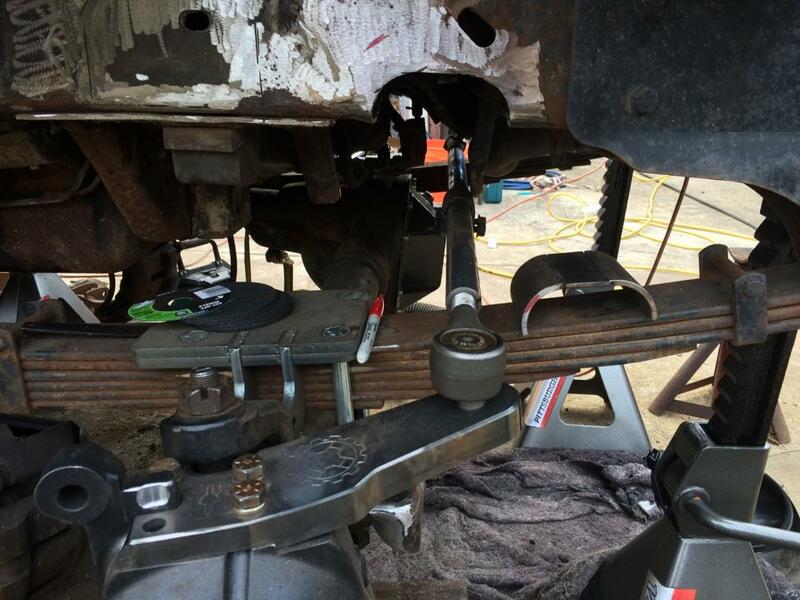 I found that the only way to all but eliminate bump steer with a straight axle, is to modify the passenger side knuckle to accept a newly located 'high steer' arm. looks like there isn't much room for your suspension to travel upwards. is that just the angle of the pic? Yes. You send in your Dana 60 passenger side knuckle to be machined, milled to a 'flat top', with a both a 'step' and a 'key', and a very snug fitting 4 bolt pattern. The result is a new steer arm that's attached 'belt and suspenders approach', that resists twisting, and should never work loose. The most solid attachment scheme I could find. It's part of a kit, but like a lot of things Chris sells, available alacart. My van only has a 4" lift, so there's not much room under there. I added a "C Nothch to the frame, to make certain the drag link would hit the frame at full compression simultaneous full left hand lock. In for a nickle, in for a dollar, what's another 4 hrs, right? This shot was taken supported by jackstands on the frame, when finished. It's got about 3" before the bump stops engage, and another 3/4" compressing the urethane. I looked around his site but didn’t see an option for that piece. I’ll have to reach out and inquire. I also was looking at it wrong. I was thinking the spring would hit the arm, but it all moves together, duh, lol. Was wondering what that u-shaped was in the pic. I need to pay closer attn. thanks for the explanation! I was gonna get a pic yesterday, but was heading to 6 States for a "consult" today. I thought it would be inside, but was in the muddy parking lot. I'll get one when the ground freezes! Effing Awesome! This is exactly what the sales guy at 6 states was trying to explain!!!! Perfect example of how my front end is set up! So easy to see with your pics! He gave me the name of a local state fleet mechanic that has years of experience repairing failed mods as a geek off-roader with a side business! Tom, are your spring shackles in the front or back? Mine are in the front and I'm told they need to be reversed which will help with ride quality. Love your quote about under vs oversteer! Made me laugh as I thought that must hurt! My spring shackles are toward the rear, the UJOR kit in engineered that way on purpose. It costs more, makes the conversion job more tooling and time consuming, but for a heavy van, I believe it's the way to go. Not for a smoother ride however, but for better (safer) manners under braking. So far as comfort while just cruising down the road, I see no reason for shackles front, or rear (of the front leaf springs) to make any difference in ride quality. Longer leaf springs however, are know to smooth out the ride. You can find all sorts of 'opinions' on which is better on a fron axle, shackles forward, or shackles rearward all over the internet. Usually argued by guys that have their egos all wrapped up in one methodology or another, mostly based on what they already own so they defend it. I did my own research when I lifted my Suzuki Samurai, and I understand automotive suspensions pretty well. It handles poorly under heavy braking on the street BTW. The longer leaf springs (Jeep YJ) make the Sami ride so much more smooth. I believe the two are mutually exclusive. I'll explain; It's all about leaf spring 'wrap'. Every leaf sprung rig does it, but you engineer so it's effect doesn't work so much against you, to minimize negative effects. Both work, but one works better than the other. Not by a huge margin, but noticeable. For trail rigs, I don’t think it matters much. Imagine the effect of wrap during a heavy braking or panic stop for a minute. There are several forces going on at the same time that need consideration. Force #1) The axle with it’s brakes/wheels and tires, (think one solid assembly) is trying to halt the 9000lb rig, where the body and frame are trying to continue forward, trying to pass the front axle. Force #2) The rotational forces on the axle housing from braking, puts the front half of the leaf spring pack in tension, while putting the rear half of the spring pack in compression. The front half in tension, tries to ‘unfold’ the shackle and spring (like straightening out your arm, at the elbow). The rear half of the spring pack in compression and twist, tries to flex the rear half into an S shape. In the braking scenario, the front axle assembly moves rearward (or the body/frame tries to climb over the axle if you prefer), shortening the wheel base a small amount. This puts the entire front suspension system in this ‘confused tug of war’ where braking can cause 'bad manors' such as chatter (think 'wheel hop' on a leaf sprung muscle car), the increased front end dive can magnify an existing bump steer problem, brake steering if on an uneven surface, where LF vs RF tire traction is changing might also add brake steering. ABS might make this less noticeable. 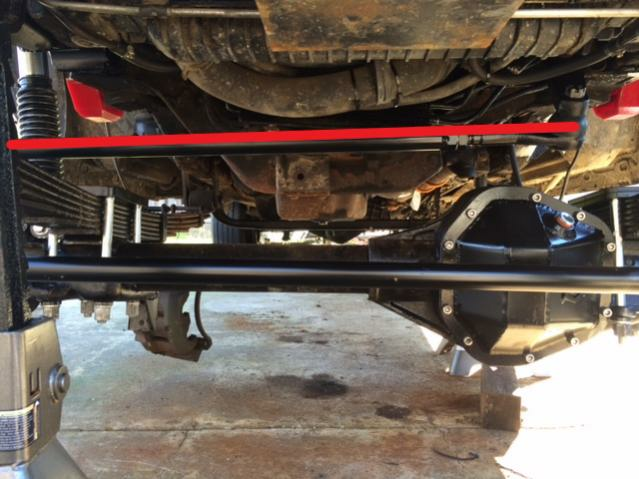 Short, stiff leaf springs that some 4x4 upfitters use, reduce the effects, I outlined above. Buuuut, you guessed it, at the expense of ride quality.